This may also be a good opportunity to extend an invitation to those in the congregation who you know can sing, but for whatever reasons aren’t currently connected to a choir. Invite families to join and sing together in this special service. Once you have some ideas of how you want to combine your choirs and ensembles, it’s time to think about music. If you’re including your children’s choir, think about an anthem that is both accessible and appropriate for them. This includes: a good singing range, appropriate text, and accessible part-writing. Remember, even if you’re not asking them to sing in multiple parts, it may be challenging for them to stay on the melody line if the other parts are moving in parallel 3rds or 6ths with them. If you’re including your youth choir, consider what’s accessible and appropriate for them: is the text relevant? Is the part-writing accessible? Are the ranges appropriate for those with changing voices? If you’re including your handbell choir, think about what’s accessible for them, level-wise. Also, how many people will that take out of your adult choir? Will you still be okay on parts? These anthems are written for unison or 2-part choirs. Have your choirs sing together in unison or take turns singing different verses, and have each choir take a different line when it splits into two parts. Great for youth and adults! Might be a little out of reach for children’s choir. Have the choirs take turn singing different parts of this unison melody, then come together at the end. The melody is the traditional hymn version. Consider having your children’s choir sing Part I and your youth or adult choir sing Part II of this spirited Spanish canon. These anthems are written for SAB choirs, or 3-part mixed. If that’s accessible for your youth choir, have them join the adults and have your children’s choir sing along on the melody in different places. The verse/chorus structure of this anthem works well for featuring different choirs. Have each choir sing a verse alone, then join together on the chorus each time. This anthem works great as a processional. Have the children’s choir sing the top line throughout. Here’s another anthem with verse/chorus structure; have each choir sing a verse by themselves, then sing together on the chorus. This anthem is written for SAB choir and praise band and would work well as a combined anthem for youth and adults. 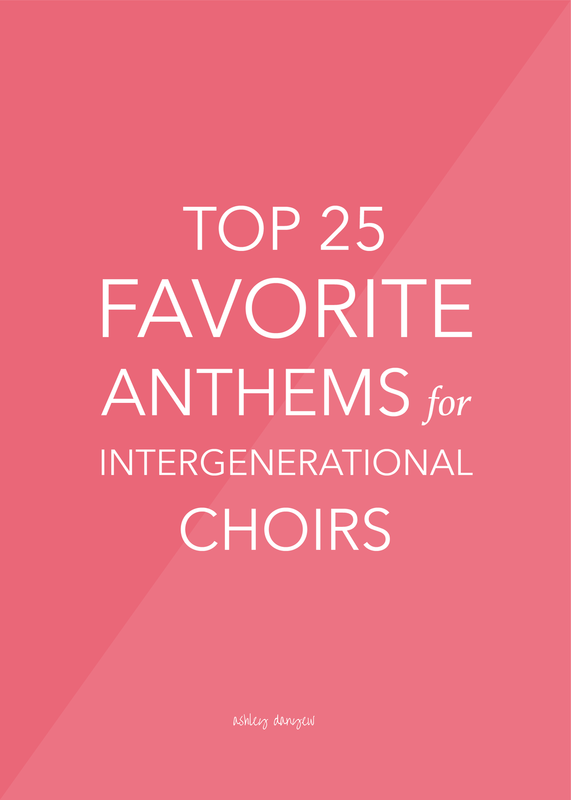 These anthems are written for SATB choirs, but I think they lend themselves well to being sung by an intergenerational choir or combined choirs. The unison lines from the doxology (slightly different from the hymnal version) would be a nice way to feature a children’s or youth choir. The optional percussion parts are a wonderful addition. The repetitive nature of this anthem makes it accessible for youth choirs to sing (perhaps in 2- or 3-part), and there’s a lovely descant that works well for children’s voices. Accompanied by Djembe or Conga Drum, this a cappella anthem has accessible 4-part writing, a repeated chorus (great for children’s or youth choir joining in), and great text. Accompanied by African percussion, this anthem begins simply with a unison melody, expanding out to 4-part harmony. It works well as a processional: have your youth choir sing in 2-3 parts and have your children’s choir sing the melody line. A unique Advent/Christmas medley, featuring “Let All Mortal Flesh Keep Silence,” “Still, Still, Still," and “Infant Holy, Infant Lowly.” A great way to feature different choirs and include a few handbells or handchimes (8 notes total). Simple text, repetitive melodic material, and limited part-writing make this anthem accessible for all ages. These anthems are written specifically for combined choirs - adult and children or youth and children. These anthems are available in a few different voicings, meaning you can purchase different octavos for each choir. For instance, purchase the Unison/2-part scores for your older elementary children’s choir and the SATB version for your adult choir. Available for Unison/2-part, 3-part Mixed, and SATB Choir. Consider having the women of your adult choir combine with your children’s choir using the Unison/2-part scores. Available for Unison and SATB Choir. Beautiful text, especially appropriate during Lent, I think. Available for 2-part and 3-part Mixed Choir. A great opportunity for your choirs to sing in Spanish! Available for 2-part and SAB/3-part Mixed Choir. A great way to begin your Palm Sunday service! Available for 2-part, 3-part, SSA, TTB, and SATB Choir. This anthem features accessible Latin text and beautiful melodic lines. Written in memory of the children who lost their lives in the 1995 Oklahoma City bombing and all children who are victims of violence. Available for Unison/2-Part and SATB Choir with opt. C Instrument. Very appropriate for Lent and Holy Week services. Available for 2-part and 3-part Mixed Choir. The simple Latin text is roughly translated, “Where charity and love are, God is there. Love of Christ has gathered us into one. Let us rejoice in Him and be glad. Let us fear, and let us love the living God. And from a sincere heart let us love one.” (source) Appropriate for Lent and Holy Week; Maundy Thursday, in particular. Available for 2-Part, SAB, and SATB Choir. A fun partner song featuring “Shall We Gather at the River” and “Down to the River to Pray." What are your favorite intergenerational anthems? I’d love to hear. Please leave a comment below!